What happens when the manufacturer of the world's largest consumer vehicle joins forces with the leader in the automotive speaker cabinet industry? The result is a sound that will literally take your breath away. When Southern Comfort Conversions, a treandsetter in the field of high-end conversion vehicles, decided to upgrade the sound system for their massive International CXT trucks, they turned to Audio Enhancers, an international provider of custom-built automotive speaker enclosures. Audio Enhancers and Southern Comfort Conversions teamed up to engineer an entirely new level of acoustically correct sound within a world-class enclosure exclusively designed for the International CXT. By joining forces, these companies have been able to offer customers the most cutting-edge sound capabilites available in the market. Southern Comfort Conversions prides itself on offering customers the ultimate in innovative automotive accessories, such as a phenomenal sound system resulting from a new speaker enclosure Audio Enhancers designed to be custom fit into the International CXT chassis. To meet Southern Comfort Conversion's goal of enhancing the sound system of the International CXT truck, Audio Enhancers had to surmount numerous challenges. "The space we had to work with was limited," explained Ted Sharp, president of Audio Enhancers, "so that made the design more difficult. The solution was to down-fire the subwoofer, which protected it while also creating a loading effect and increasing bass output." The custom-built enclosure combines a forward-fire slot-port with a down-fire single 12" subwoofer. The resulting audio enclosure not only empowered Southern Comfort Conversion to achieve their objective of upgrading the Internationl CXT's sound system, but they are now able to offer an entirely new level of superior sound that has never been available ina "one-off" factory-designed vehicle. Audio Enhancers is also adding a dual 10" version of this enclosure, which is being designed to accommodate a pair of Memphis Car Audio, M3 Memphis subwoofers and a Memphis Belle amplifier. The dual 10" version will be unveiled at the 2005 November SEMA show in Las Vegas, the premier automotive specialty products trade event in the world hosted by the Specialty Equipment Market Association. Established in 1979 by Rod McSweeney, Southern Comfort Conversions builds conversions for General Motors, DaimlerChrysler and Ford, customizing new vehicles for distribution at new car dealerships. 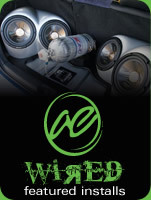 During the past 23 years, Audio Enhancers has supplied car speaker cabinets to more than 750 dealers, seven distributors and numerous OEM accounts. 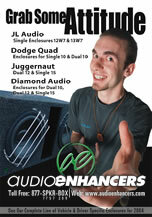 Audio Enhancers, based in Ardmore, Tennessee, is an international provider of a wide selection of audio speaker enclosures, boasting the world's largest selection of vehicle-specific and driver-specific models. 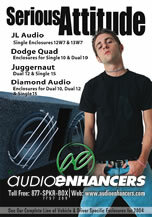 For more information about Audio Enhancers, please call us at 866.775.7269 (SPKR.BOX) or visit www.audioenhancers.com. To learn more about Southern Comfort Conversions, go to www.southerncomfortconversions.com.